Tip: ask if they have special AAA rates. Remember, this is the high-season for Ojai tourism...so even the least expensive prices will be higher than normal. Plus, Ojai is a small town, so "big city" cheap rates are difficult to come by, here. If these prices aren't low enough for you--check local hotels/motels in nearby Ventura, a 20 minute drive from Ojai. Pepper Tree Retreat Former abode of Krishnamurti, on Ojai's mystical, orange-grove filled East End. It has a B&B feeling and is nestled in the citrus groves, tucked amongst the trees with mountain peaks and meditative, sweet gardens. Totally peaceful, quiet and charming with yummy breakfasts and amazing views. A Non-profit, so your stay is tax deductable! 1130 McAndrew Road. For best deals and reservations, go online: http://www.peppertreeretreat.com (877) 355-5986. PETS: The Ojai Valley Inn, Ojai Rancho Inn, Emerald Iguana and Capri welcome your pets. If you are coming with a group, and or would like to make your time here extra special, we recommend renting a private home. 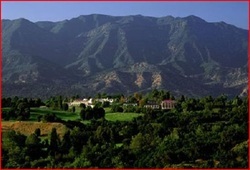 Ojai Vacation Center offers access to beautiful, luxury private homes, bungalows, cottages and farm houses. Range of prices and locations. (805) 640-2800 http://www.ojaivacationcenter.com/. Give them your price range and they will work with you! Stay in Carpenteria ~ Carpenteria is a secret beach town just 10 minutes south of Santa Barbara and only a 30 minute drive from downtown Ojai. The 150 is a beautiful magical contry road. You can find affordable motels from the town's Visitor Center.